“Bhalukpong is true mini-Arunachal and mini-India,” said Chief Minister Pema Khandu in his speech at a public gathering at Bhalukpong. He recalled former Chief Minister Gegong Apang who had first coined those words for the town. The Chief Minister, who is on route to Tawang district for a six-day visit for upcoming Tawang festival, first arrived at Bhalukpong from Itanagar. He was given a rousing welcome by hundreds of people lined along the street to cheer him with khada shawls, along with Parliamentary Secretary (PHE&WS) Kumsi Sidisow. Cultural troupes from Sajolang, Hrusso, Galo, Apatani, Nyishi, Nepali, Bihari and various other communities formed the part of the crowd who were present to welcome the Chief Minister, reflecting the cultural diversity of the town. Similar rousing reception was accorded to the Chief Minister at Bomdila district headquarters, by local MLA Japu Deru, Deputy Commissioner Dr Sonal Swaroop, Superintendent of Police PN Khrimey, and others. Earlier on way to Bomdila, the Chief Minister was given a warm welcome by school officials and staffs of government middle school, Sessa. He stopped to meet the school children and interacted with school staffs. Holding a meeting with top officials from West Kameng district at Bomdila Circuit House, Chief Minister advised the officials to work for people and not to maintain distance with them. “Remember we all are public servant and should be always available to them at their service,” he urged and asked the officials not to leave their place of posting without due permission from additional deputy commissioner. 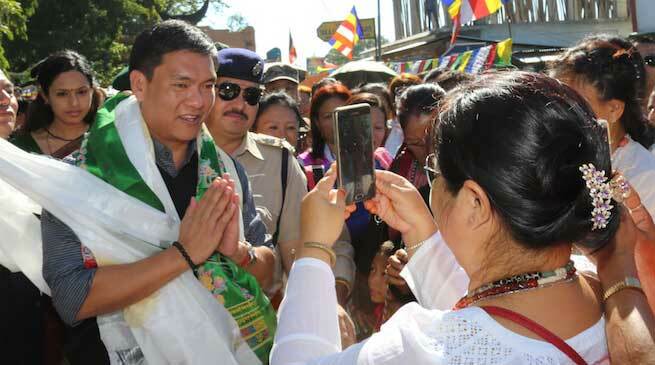 Khandu, however, keeping in mind the threat to government officials said the government will not compromise with hooligans trying to intimidate or threaten them. Stressing on benefits of all government flagship programmes to reach the last needy people, the Chief Minister asked the officials to work in close coordination with the local MLAs. He observed that many of the legislators were themselves unaware of the government flagships programmes, which resulted in many important schemes unused. Khandu therefore announced to conduct an interaction programme between legislators and government officials to generate awareness on government of India schemes. The Chief Minister said since people have high expectations from the present government, he promised to prepare best budget for the next financial year for which the government of India is willing to help. He said the budget will be self-designed where all issues of people will be addressed. Khandu also stressed on having improved relation with neighbouring Assam to solve boundary issues and various other inter-state issues. He hoped on solving the deadlock over construction of 2000MW Lower Subansiri dam with Assam government. Upon commissioning, the dam is expected to generate huge revenue for the state. Further he informed that the state government is working towards equipping young generation with high-end skills programme, adopting Sikkim model of achieving organic status for the state and improving tourist circuits across the state. On political level, the Chief Minister informed that BJP high command has assured ‘free hand’ to the state government with no interference from party level to run the government. On development front, the centre has deputed Niti Aayog CEO Amitabh Kant and DONER Minister Dr Jitendra Singh to take care of the developmental needs of the state, informed Khandu, which was the result of his recent visit to New Delhi. Later, on Chief Minister’s arrival at Dirang, he was accorded a warm welcome by Parliamentary Secretary (Health) Phurpa Tsering along with local public and government officials. He was also warmly received by Inspector General of SSB Sarwan Kumar at the SSB 30 Bn camp at Dirang. Khandu visited the newly constructed Thupshung Dhargyeling Monastery at Dirang, which is expected to be more beautiful than the 400-year-old Tawang monastery upon full completion finishing works and other landscaping works.